There is a name for those who have been in love of purchasing SiriusXM’s product, that is SiriusXM subscribers. It is appeared in the official website of SiriusXM. Among the hundred types of SiriusXM, there are 2 series that will being compared to each other. The name of the products are SiriusXM SXV300v1 and SiriusXM SXV200v1. By only 100 hundreds apart, what makes them stand differently to each other? If you have to choose, which one is the best for you? Find the right choice for you through reading this article. We may help you decide by writing the detail of both SiriusXM series. Let’s enjoy! With SiriusXM SXV300v1, you can connect, control, and enjoy all the wonders of satellite radio on the sly. The compact tunner of SXV300 is truly plug and play with compatible car stereos and installs easily and discreetly behind the dash for a fully integrated look. It has single interface cable connection and Pause, Rewind and Replay menu up to 60 minutes of live Satellite Radio. BY using TuneStart, TuneScan and TuneMix, you can automatically start songs from the beginning on you favorite channels, preview songs and hear a mix of songs from your favorite channel. And with the SportsFlash or Traffic and Weather can keep up with the big plays for your favorite teams and move with the most current updates. And if you purchase with iTunes radio tagging, you can discover new music and tag. Lastly, SiriusXM SXV300v1 is compatible with all SiriusXM-Ready car stereo receivers from leading manufacturers. SiriusXM SXV200V1 tuner lets you receive satellite radio programming in your car without the need for any additional cables or interfaces. It is equipped with a compatible car stereo, pause or rewind or replay menu up to an hour of live broadcasts, alerts when your favorite song or artist is playing, and with your IPod connected, you can tag songs for purchasing later in the iTunes store. 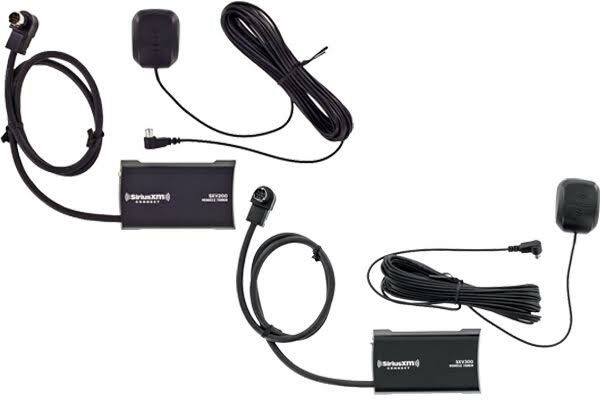 There are the product highlights that you can get from SiriusXM SXV200v1 like SiriusXM vehicle connection package includes hideaway tuner and magnetic antenna, it works only with in-dash receivers with the SiriusXM-Ready logo, it has game, song, and artist alerts, and you can enjoy new SiriusXM Xtra Channels (depending on your subscription package). All in tuner dimensions of 2-1/8″W x 3/4″H x 3-7/8″D. Because of The SiriusXM SXV300v1 is the upcoming product and SXV200v1 is the previous one, SiriusXM has made the upcoming one is better than current. The features on SiriusXM SXV300v1 has upgraded and added with the sophisticated things to make the performance well-being when someone use it. But, there is no wrong if you choose to purchase with SiriusXM SXV200v1 because, we already know that this product gained enough good reviews. otobemo.com is a participant in the Amazon Services LLC Associates Program, an affiliate advertising program designed to provide a means for sites to earn advertising fees by advertising and linking to otobemo.com (amazon.com, amazonsupply.com, or myhabit.com).